The Lettered Artist Edition books are nearly finished at the hand-binder and we’re extremely pleased with how they’ve turned out. 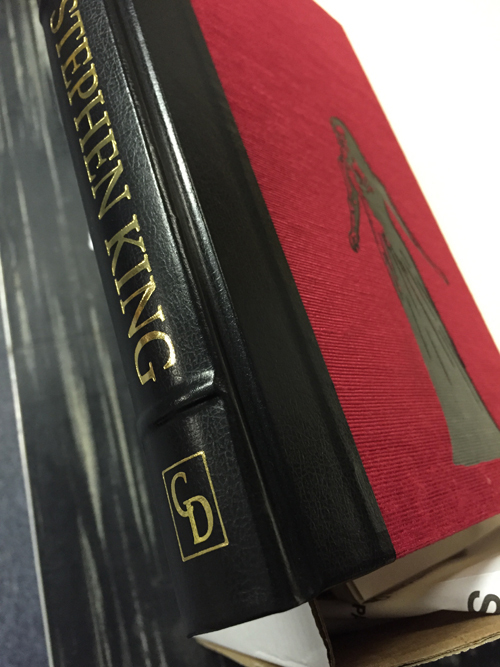 This edition features a “three piece” binding of leather and Japanese book cloth, hand-made spine hubs, hand-gilded page edges, and other fine touches to make the edition truly special. Now that the books are nearly done, the traycase maker is preparing the prototype for the traycase. 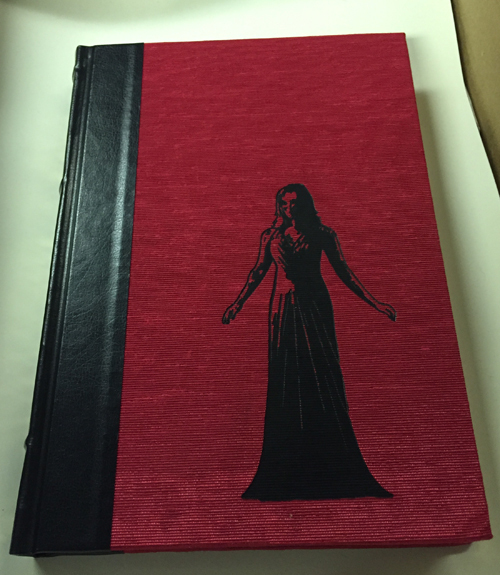 We’ve never made a traycase exactly like this before, and each one will be sized by hand to fit the book. We think our collectors will be very pleased with the final presentation. So ah, Brian my ol' pal, ol' buddy.... How does one get on a list that may enable him to purchase a PC copy of the lettered if there was one left over.......? That is a beautiful book Brian, nice job. You want to reserve the same number to get the entire set. That is where the value of such a commitment and investment would make sense. I loved reading this post as it fits me to a T. I am finally to a point in my financial life that I have some room to splurge here and there and decided to start collecting King. My initial goal was to eventually have a 1st edition of every title of his, but discovered the world of limited editions and amreally enjoying hunting for those. I barely got in in time to order an Artist Edition of Carrie and have pre-ordered the AE of Salem's Lot as well with intentions of getting all 6 with matching numbers, which brings me to a question. I had assumed they kept track of which customer had which number and would automatically match them up for me as we go, but is this not the case? Do I need to do something further to insure I get the same number as I did for Carrie? Received Carrie on Monday of this week and absolutely love it. My first traycased book! My only problem is my overwhelming desire to read it lol. AstroDad wrote: I had assumed they kept track of which customer had which number and would automatically match them up for me as we go, but is this not the case? Do I need to do something further to insure I get the same number as I did for Carrie? For this series, we are tracking the numbers by customer order, but we'll also email everyone who orders 'Salem's Lot to double-check and make sure our records are correct before we ship that one. Perfect. Thanks for the quick response Brian! I plan to buy Salem's Lot hopefuly Friday. I got Carrie with a remarq and would like to do the same here but money is an issue. how long till you take orders for the remarq? Ga Outlaw wrote: I plan to buy Salem's Lot hopefuly Friday. I got Carrie with a remarq and would like to do the same here but money is an issue. how long till you take orders for the remarq? We'll probably wait at least a couple of weeks, so we can get all of the orders processed first. It could be even longer depending on the workload at the office. The Gift Edition crossed the 50% sold out point this morning, much faster than Carrie did. The Numbered Artist Edition is 90% sold out. The Lettered Artist Edition is 100% sold out.